On February 21st the Haverford Choral Association held their annual Choral Cabaret benefit concert. An evening that showcases the talents of our choral students who perform contemporary numbers individually or in small groups with instrumental accompaniment. The finale of the evening was an outstanding performance by Haverford High School’s award-winning Chamber Choir and Concert Chorale performing Queen’s “Bohemian Rhapsody” and “We Will Rock You”. 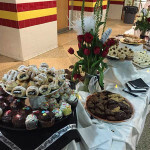 The Haverford Choral Association thanks everyone who made this event possible; our wonderful volunteers, everyone who donated delicious desserts that so gorgeously filled our intermission buffet tables, the choral students for pulling out the stops and putting on a fantastic show for their audience! And of course, Marsha core, the true heart of this choral program. Without her inspiration and belief in her students, a night like cabaret would not be possible. A BIG THANK YOU to the following families and businesses that donated to the fabulous silent auction. Haverford Choral Assoication looks forward to the 2017 Choral Cabaret!